Downbound near Marysville on April 21, 2007. 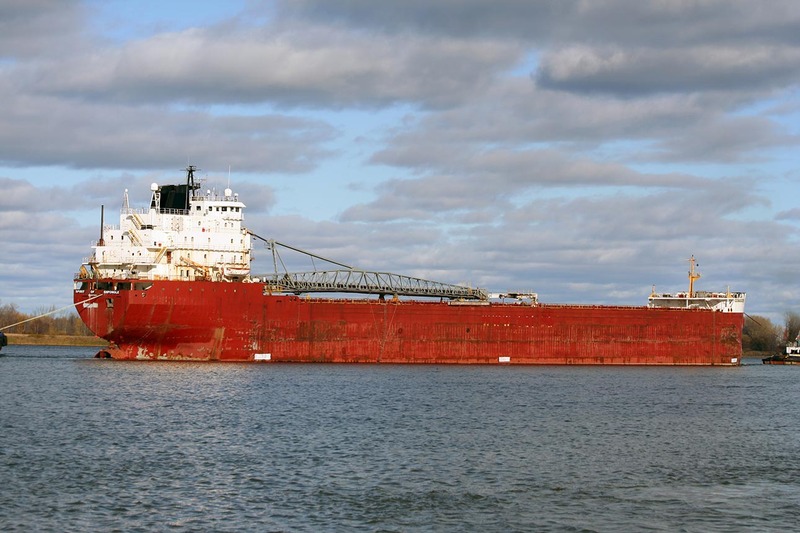 Built as hull #225 by Collingwood Shipyards, Collingwood, ON; this Great Lakes and ocean class self unloading bulk carrier was launched November 1, 1984 as the a) Hon. Paul Martin for CSL Group, Inc. (Canada Steamship Lines Inc., managers), Montreal, QC. Due to revised Seaway regulations allowing longer vessels (from 730’ to 736’06 ½") at the time; this vessel became the largest vessel (overall dimensions) to have been built by this yard. Burning intermediate grade 180 fuel, the vessel is powered by a Sulzer 6RLB66 two stroke cycle, single acting 6 cylinder 11,100 b.h.p. diesel engine built by Sulzer Bros. Ltd., Winterhur, Switzerland. Power is provided to a single controllable pitch propeller giving her a rated speed of 16.1 m.p.h. Seventeen hatches feed into 5 holds where she can carry 26,320 tons at maximum Seaway draft of 26’ 06" and is capable of carrying 37,411 tons at her mid summer draft of 34' 01". The cargo is unloaded via a gravity fed belt system through hydraulically controlled gates to a loop belt elevator feeding a stern mounted 262’ discharge boom that can be swung 90 degrees to port or starboard and unload at a rate of up to 5,413 tons/hour (ore) or 3,937 tons/hour (coal). The vessel is equipped with a variable pitch bow thruster and has a bulbous bow. On April 6, 1985; the Hon. 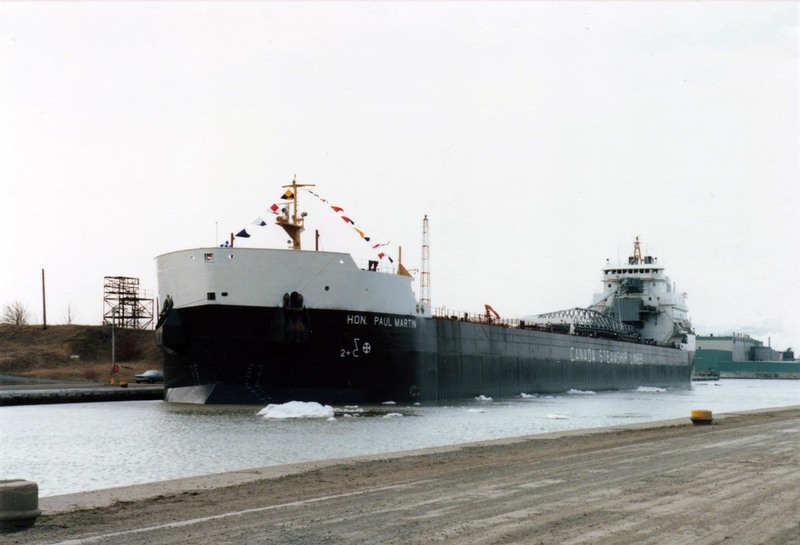 Paul Martin left Collingwood on her maiden voyage in ballast to Thunder Bay, ON where she departed April 19, 1985 for Quebec City with a cargo of grain. September 15, 1985 saw the vessel load her first cargo of gypsum at Halifax, NS for delivery to Tampa, FL and New Orleans, LA. June 24, 1988 saw the Hon. Paul Martin return to the Great Lakes and Port Weller Dry Docks, St. Catharines, ON for repairs to her self unloading system following problems experienced in unloading a cargo of gypsum. On September 23, 1988; while at the fit-out berth at Port Weller Dry Docks following the repairs, the prop wash from the Hon. Paul Martin capsized Port Weller Dry Dock’s tug James E. McGrath which was assisting in maneuvering the vessel. The two crew members of the tug were rescued and the tug was raised the next day. 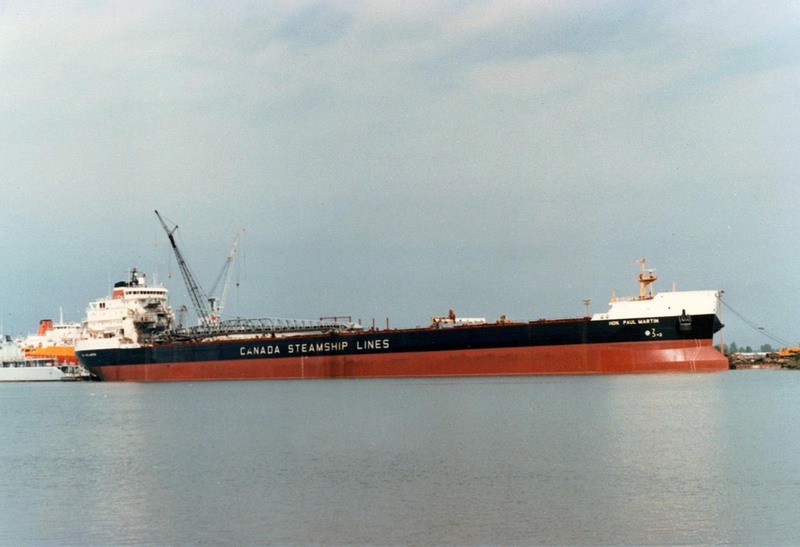 The vessel was renamed b) Atlantic Erie on December 6, 1988 in Savannah, GA. The vessel’s new name reflects upon the vessel’s dual ocean and Great Lakes service; "Atlantic" for the Atlantic Ocean and "Erie" for Lake Erie. On April 11, 1989; the Atlantic Erie was reflagged out of the Bahamas with her port of registry becoming Nassau and resumed activity in the gypsum trade along the east coast between Canadian and U.S. ports and ports in the Caribbean and the Mexican west coast. The years 1992 and 1993 saw the vessel carry petcoke from Corpus Christie, TX to Valencia, Spain; iron ore from Rotterdam and Narvik to Bremen; and stone from Jelsa, Norway to Hamburg, Germany. The vessel returned to the east coast gypsum trade in December of 1994. While trading on the east coast, the Atlantic Erie was one of the vessels reporting weather conditions in the midst of hurricane "Jerry" in 1995. The Atlantic Erie was reregistered Canadian on August 23, 1996 with her port of registry now Halifax, NS. The vessel returned to the Great Lakes for a short period before being rigged with special off loading gear required to carry and unload magnetite ore to ballast the Hibernia Oil Platform. With fleet mates Atlantic Huron and Nanticoke; the trio of vessels carried 411,000 metric tonnes of this product from St. George’s Bay, NF to the platform located off the Grand Banks, approximately 195 miles southeast of St. John’s, NF. Each vessel carried four of these cargoes. The ore had to be unloaded in the form of a slurry consisting of 8% ore and 92% water thus requiring the special unloading equipment. After dry docking at the Verrault Shipyard, Les Mechins, QC; the Atlantic Erie emerged October 6, 1998 sporting a freshly painted red hull and one of the largest web site addresses on the side of her hull: www.csl.ca. The address length stretches 125 feet and 7 feet high with each letter being approximately 7 feet by 8 feet in size. 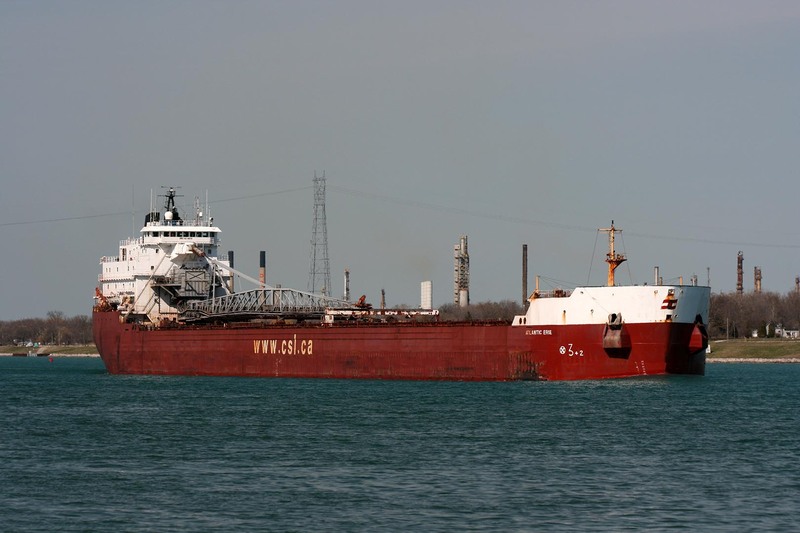 The Atlantic Erie reported a steering malfunction while downbound on the St. Clair River near Stag Island on November 15, 1998. The vessel went to anchor on the Canadian side of the river to make temporary repairs. 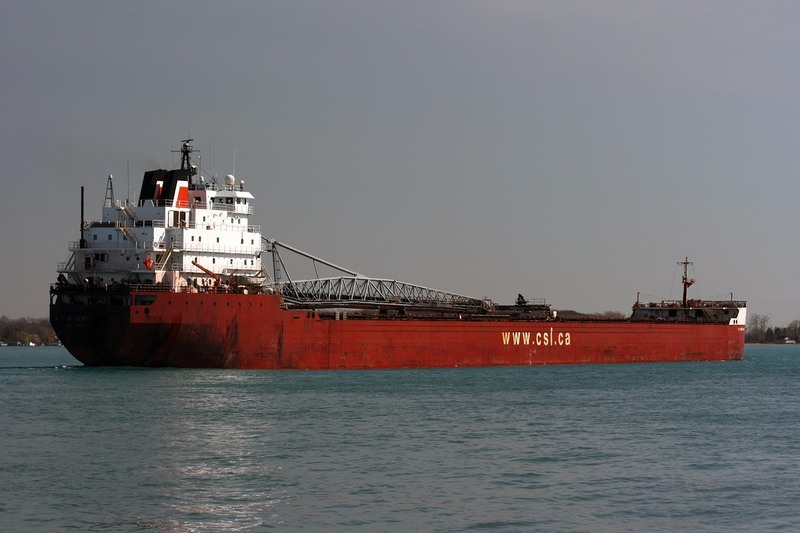 The following day, the vessel docked at Windsor, ON for further survey and damage assessment. The Atlantic Erie had interior structural and mechanical work done including new bulkheads, some steel renewal for her holds, as well as some hydraulic and pipe replacement (tunnel) during March and April, 2000. This work was completed by Fabco Industries Ltd. of Dartmouth, NS. After completion, the vessel loaded gypsum at National Gypsum, Halifax on April 21, 2000 for Camden, NJ. The vessel was busy through 2014, however she sustained damage during a Jan. 11, 2015 grounding on a sand bar off Iles-de-la Madelaine. The vessel was laid up at section 48, Montreal on Jan. 19, 2015, then was moved to section 56 south. 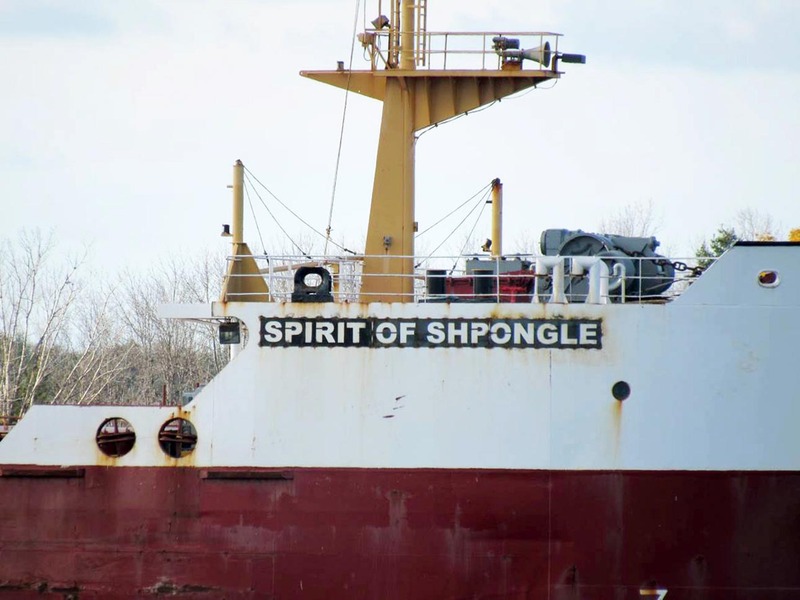 Atlantic Erie, renamed Spirit of Schpongle for the trip, left Montreal Nov. 4, 2016 under tow of the tug Pacific Hickory bound for a scrap yard at Aliaga, Turkey. The pair arrived in mid-December 2016, where both were beached. Cutting began almost immediately. On the ways at Collingwood, ready to be launched November 1, 1984. Above Lock 7 on the Welland Canal, April 13, 1985. An unusual call in Vancouver for repairs to her boom, May 1988. Getting repair work done at PWDD, Sept. 18, 1988. Aerial view underway, Oct. 2000. Cabin's in primer during a painting project, July 14, 2001. Upbound Detroit River, Sept. 3, 2001. On the Seaway, Sept. 18, 2001. On the Detroit River, April 25, 2002. In Duluth, June 8, 2002. Loading coal in Toledo, Aug. 17, 2002. St. Marys River, Aug. 28, 2002. Loading grain in Thunder Bay. Passing Marysville, April 21, 2007. Leaving Montreal under tow for Turkey, Nov. 4, 2016. Close up of the name on the bow.